Keeping the AICF’s motto of chess development every nook and corner of the country, All India Chess Federation is organizing a FIDE Trainers’ Seminar at Chennai from 01 to 03 February 2019. 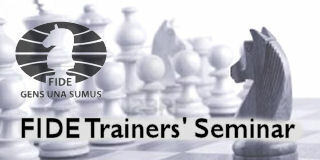 The trainers will be GM R B Ramesh and IM Vishal Sareen. Forty (40) participants from following States Kerala, Tamilnadu, Karnataka, Andhra Pradesh, Telangana, Goa, Puducherry and Maharashtra have been equally divided. The state associations of above States can nominate five deserving candidates for the seminar as per merit in which one must be woman. The respective associations need to send all the applications received by them to AICF along with merit yardstick used for selecting the five candidates. However if any seats are not filled by any state, AICF will fill the seats by candidates from other States. The deadline for sending the entry by respective state association is 30 Nov 18 and after that AICF will not entertain any request in this regard and seat will be allotted to other deserving candidates.